WINTER RATES AVAILABLE. PLEASE MESSAGE OWNER FOR MORE INFORMATION. A short walk to downtown and the city park. Loaded with character and charm, yet tastefully updated to provide all the necessities for a comfortable stay. Bright & cheery with flat screen television provided in living room and each bedroom, fireplace, hardwood floors, with central heating and air. The backyard is fully fenced and private with a covered patio area to enjoy BBQ's. Well stocked kitchen. Dan and Barbara have lived in Paso Robles since 1980. Dan is retired from his career as a professional baseball player. Barbara is recently retired from Paso Robles Public Schools. They have raised 3 sons and look forward to helping provide a wonderful vacation experience by sharing their knowledge of the area. 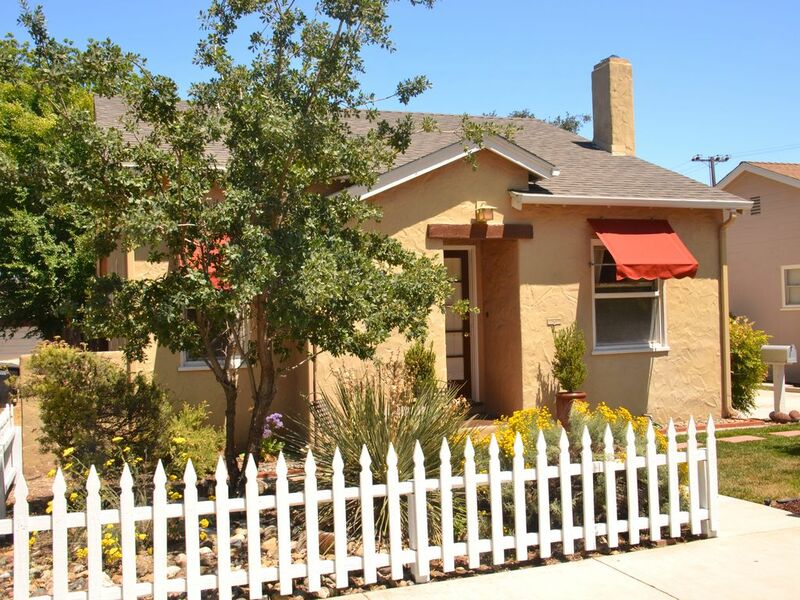 Located in the heart of Paso Robles, we love this home for the ease and convenience of walking downtown to enjoy everything from restaurants, antique stores, art studios, cinema, the city park and downtown wine tasting rooms. This house has great karma! An archway in the dining room frames a large window overlooking the backyard and provides an open & bright environment. This home is well suited for 2 couples or a family of 6. Enjoy the living room by watching DVDs or your favorite sports on the 40' HD flat screen tv. Both bedrooms are furnished with queen size beds and a 32' HD flat screen tv for your enjoyment. The private office has it's own queen size sofa/bed. The backyard is large, private and fully fenced. Located off the kitchen is a large covered BBQ area for your convenience. All linens are provided. Sheets are ironed. No fires in fireplace - for decorative purposes only. The house was perfect! We were able to walk downtown for the Art Festival and avoid all the parking hassles. Vine goes straight to the 46 west, and 24th St which means we could go wine tasting without ever getting on the freeway. The house amenities were all we could ask for, and we lived the back patio area for meals. We hope to stay there again soon. My son and I thoroughly enjoyed our stay in the house. It was pleasantly decorated, meticulously maintained, the beds were comfortable and the patio/grill were a lovely place to enjoy al fresco meals. The kitchen was well equipped. Our hosts, Barbara and Dan were very helpful when we had questions. I highly recommend staying at Vintage on Vine! I and a couple of friends rented this home for the weekend and we are so glad we did. It was a great location and the home was very clean, tastefully decorated and well-stocked with comfortable furnishings and beds. We all liked that there were TVs in each of the bedrooms as well as the living room which allowed us to retreat to our respective rooms. It was cold outside so we were not able to take advantage of the patio and BBQ but they looked very inviting had it been warmer. They owner was very easy to work with and accommodating. She responded very quickly on all the communication. I highly recommend this home particularly for a group of 3 or 4 people since there is only one bathroom. Thank you Maggie. We enjoyed hosting you and your friends. We hope you choose to stay with us again. Charming little house in the heart of Paso near the town center. Perfect location! We thoroughly enjoyed our stay here in this well maintained, clean, charming house. Thank you Barbara for making our stay so enjoyable! Thank you and we hope you visit us again! My mother and I enjoyed staying here over Thanksgiving weekend. We were close enough to walk to the park, restaurants and shopping. Enjoyed the covered patio for morning coffee or a glass of wine. The owners are very helpful and friendly. I would recommend this home for a Paso Robles get-away! Thank you Danni. We hope you visit again. We couldn’t have stayed in a better place in Paso. You are able to walk to all the shops and restaurants in town and it’s only a short drive to so many different wineries. We stayed here for 6 days so we were able to a fair amount of site seeing as well. We went to Cambria, Los Olivos, Solvang, Avila Beach and the sand dunes at Guadalupe. It was nice to come back at the end of the day and enjoy a glass of wine on the loungers in the pretty back yard. Every night that we cooked we were able to sit outside with the patio lights and candles on the table. There is a very well equipped kitchen with gas range for those that like to cook. The living room is very cosy as well. If we are in the area again we will definitely stay here. Thank you for your nice review! We would love to host you again if you are ever in our area to visit.